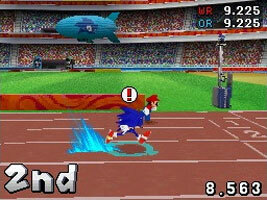 Mario, Sonic and friends take part in 16 Olympic events, including two unique to this portable version. There are also 8 Dream Events set in the Mario and Sonic worlds. Play against up to three other players with DS single-card Download Play or multi-card multiplayer. You can upload your best scores to an online leaderboard through the Nintendo Wi-Fi Connection.